Another hidden gem located, this time around the vicinity of Batu 11 Cheras. 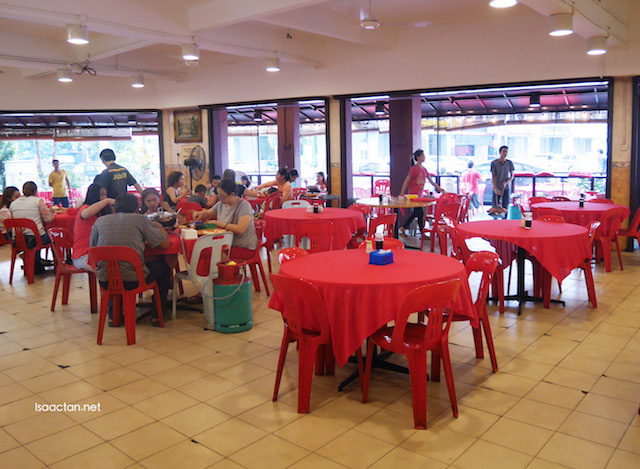 Red Gold Steamboat Restaurant @ Batu 11 Cheras has been in operation for 13 years, and folks from near and far have been frequenting them for their yummy seafood dishes. 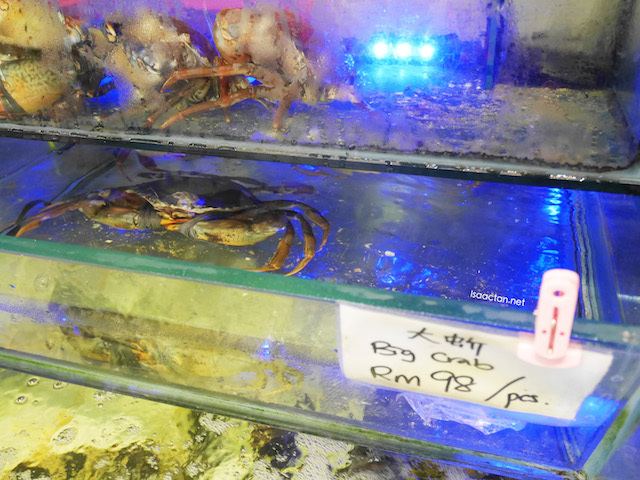 From seafood distributor, they have grown into a full blown seafood restaurant by night. I had the opportunity to try out their fares the other evening, so do check out the noms we had below. 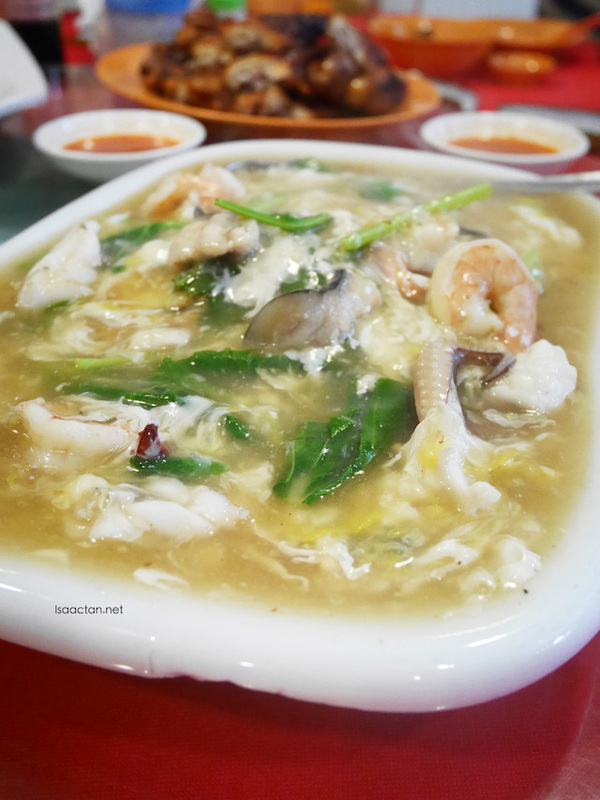 Red Gold Steamboat Restaurant is one of the key players in the local seafood distribution scene, hence the seafood here are all live ones, ensuring top notch fresh quality. 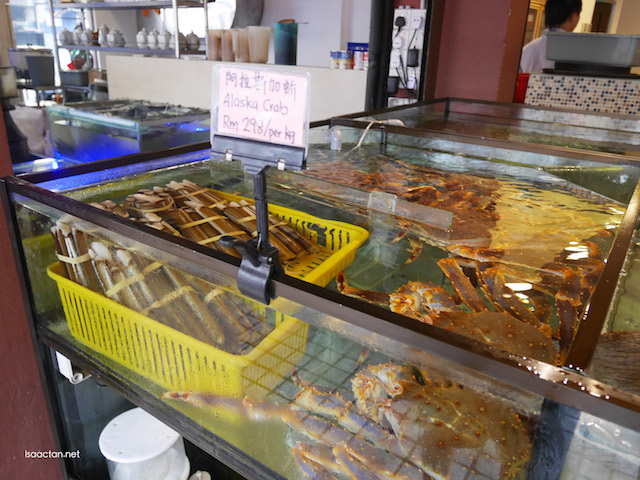 Various water tanks can be seen, the seafood only taken out when ordered by diners. 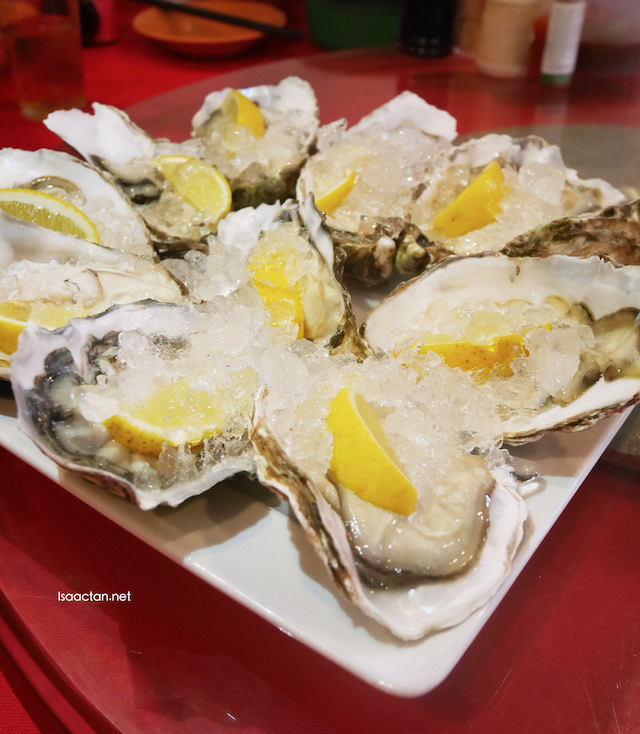 The restaurant ambiance is similar to most Chinese restaurants, but they do have another air-conditioned section for those who wants a cooler atmosphere to enjoy their seafood. We had a total of nine dishes that evening, and it was all good. Check out what we had below! Trust me when I say they are huge! Those who love to start off their meal slurping down some huge and really fresh oysters should go for these oysters from California. I'm not an oyster kind of person, hence didn't really try it. I was told it is really fresh though, with a light buttery sweetness to its taste. 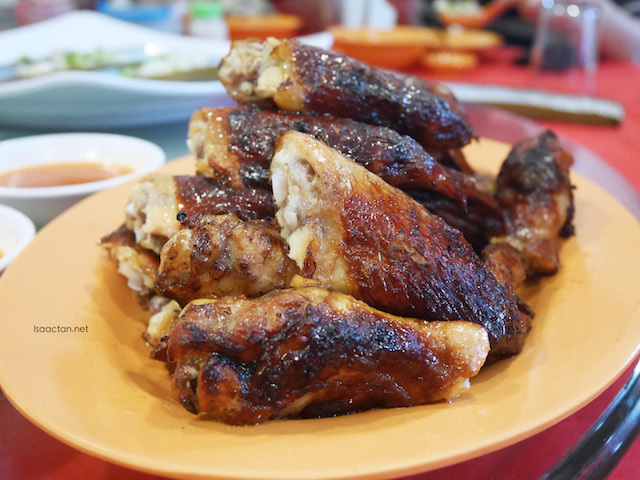 Before our main dishes arrived, we chomped down on the delectable Grilled Chicken Wings as well as their Homemade Sai To Fishcakes. Grilled to perfection with an intensely fragrant smell, love the taste of the chicken, as it's not overly done, thoroughly marinated, tender and juicy. The Sai To Fishcakes were made from fish meat of Wolf Herring, tasting good, albeit a tad salty. It's quite rare that I chance upon razor clams, even more so ones that are sourced from Scotland. 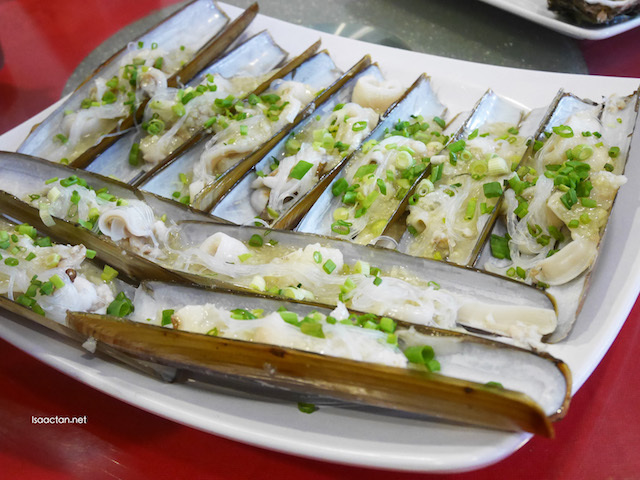 The Steamed Razor Clam with Spring Onion Garlic Sauce was served next, freshly steamed with chopped scallions together with glass noodles. Good to be taken on its own, I found it to be nice, soft and chewy. Good stuff here. 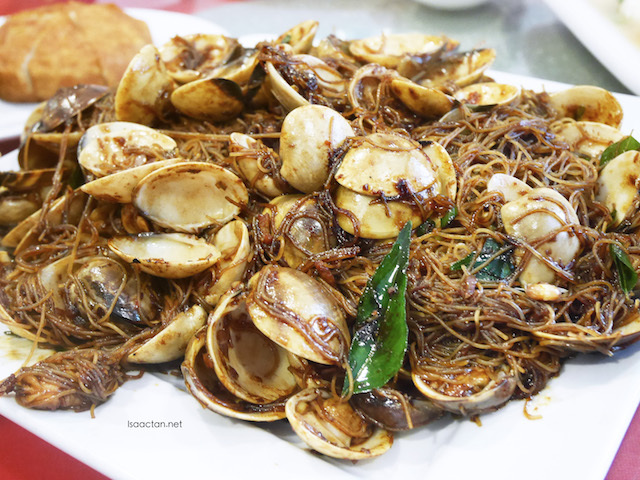 Stir fried 'kam heong' style, with lots of lala thrown into the mix, the Stir Fried Mee Hoon with Little Neck Clams has to be one of my favourite dish that evening. 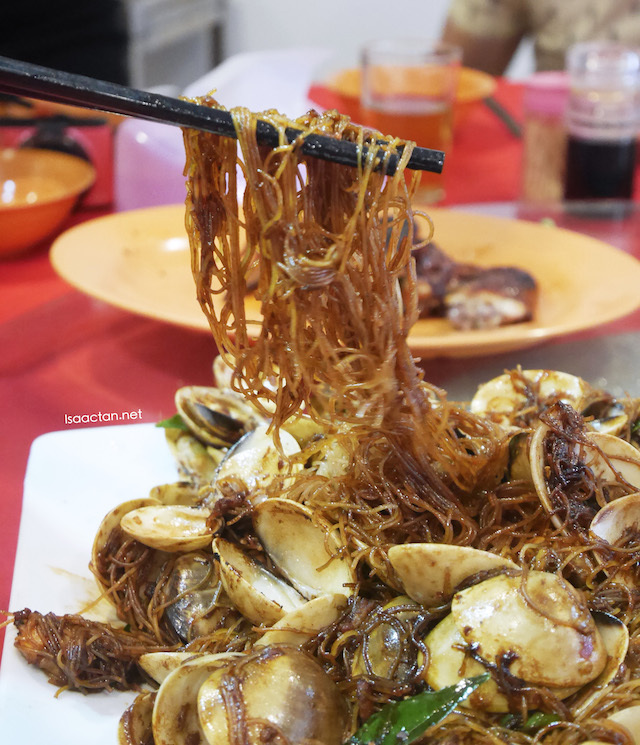 Love how the heavy flavours of the kam heong styled mee hoon blended in with the fresh lala taste. Generous amounts of the shelled delicacy can be found inside. 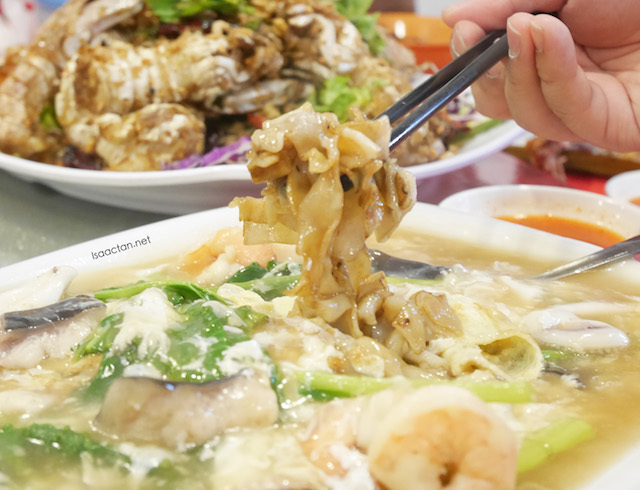 Another standalone noodle dish, we tried the Egg Coated Hor Fun next, with lots of seafood, prawns and springy squids thrown in. It was pretty okay, but sort of missing the wok hei I come to expect of the hor fun. Probably it wasn't tossed long enough. Delicious dish though, good to be taken on its own or with the other seafood dishes. Up next, the subsequent dishes are heavyweights in their own rights, beginning with the very scrumptious looking Mantis Prawns. 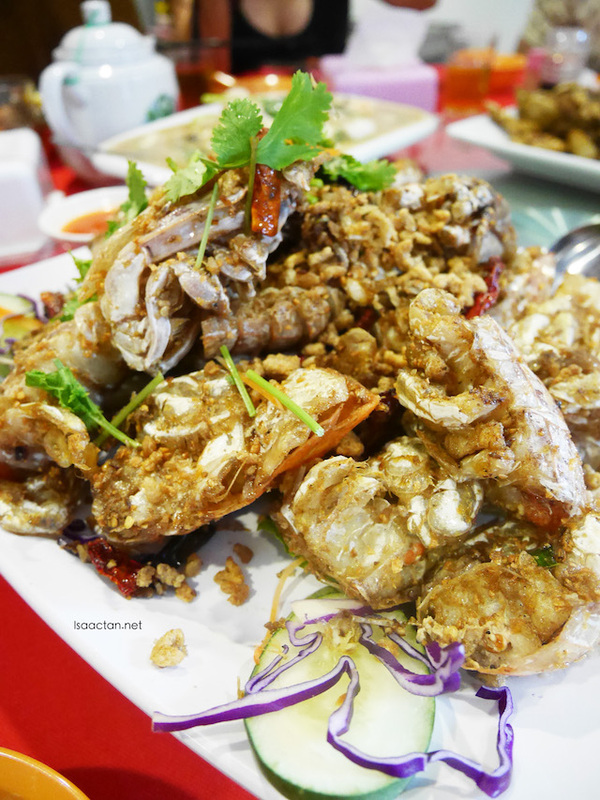 Huge pieces of the prawn is cooked in dried chillies, fragrant leaves and lots of preserved dried radish. This is really yummy stuff, one to indulge in slowly as it costs RM45 each piece! Of course, I was told the price is higher as it is not in season, so do wait up for the price to go down around June this year. 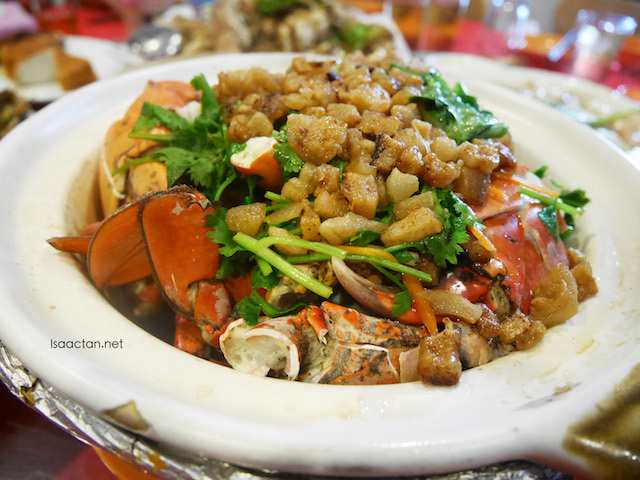 A first for me, to try these huge baked crabs in a claypot cooked with lots of crispy pork lard / pork cracklings. 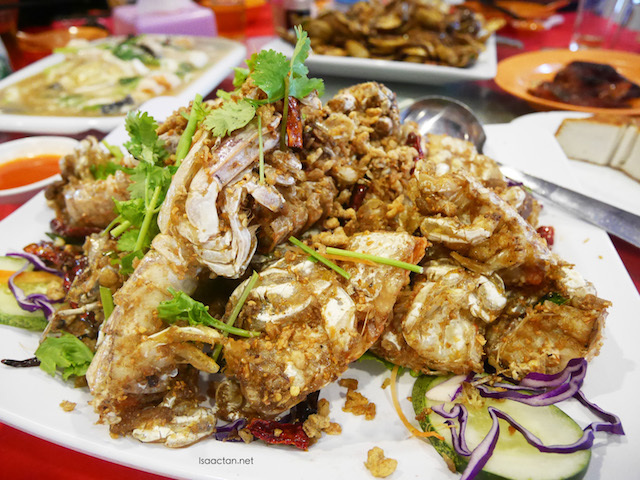 Each of these Baked Crab with Pork Cracklings dish comes with two huge XXL crabs. 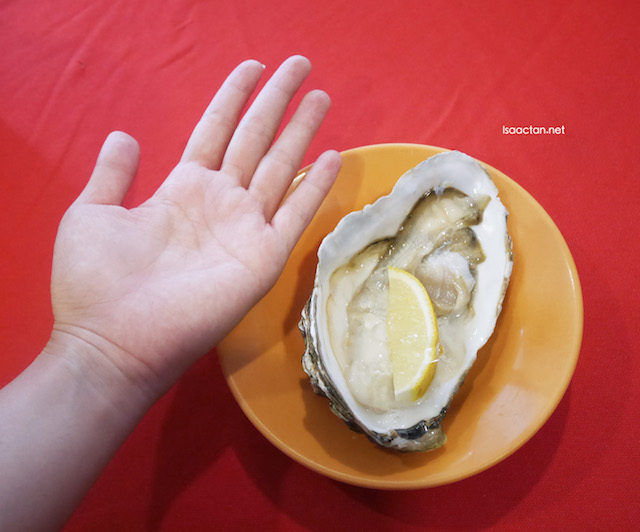 Oh my, I am beginning to think every seafood dish served in Red Gold Steamboat Restaurant is of the extra large variant. Another luxurious dish to indulge in, especially if you're a crab lover. 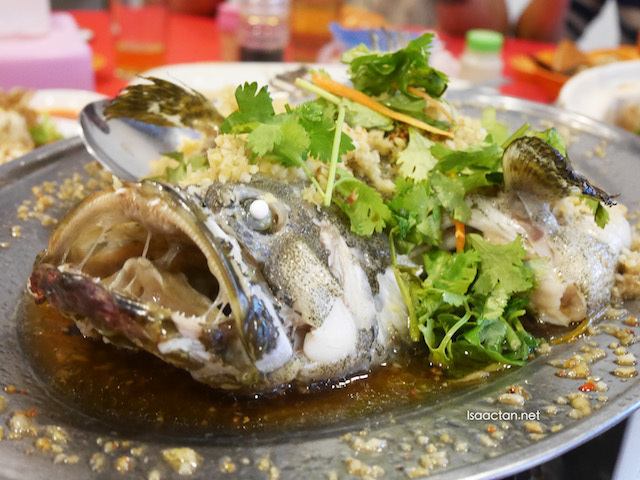 No Chinese feast is complete without a fish dish, and that night we savoured the Ginger Steamed Giant Grouper. Steamed with generous amounts of minced ginger, I do like the sauce that came with the fish. Since the giant grouper is taken alive from the water tanks, its flesh is indeed silky smooth and tender. 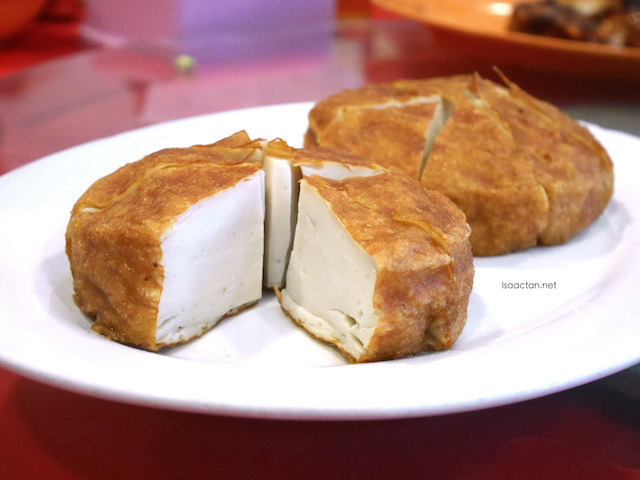 A great dish to end our "9 course meal" at Red Gold Steamboat Restaurant @ Batu 11 Cheras. 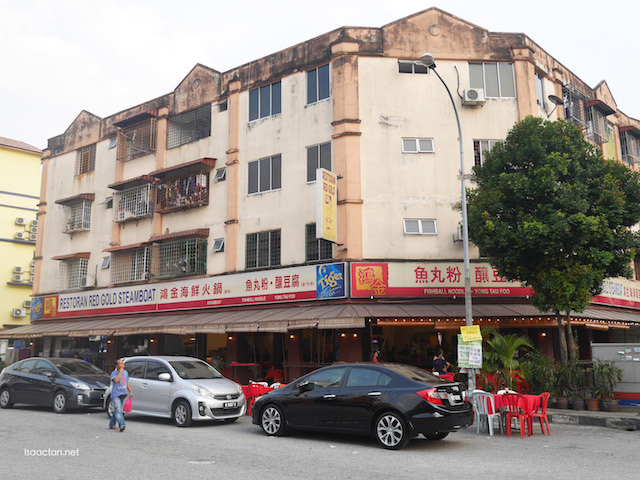 The restaurant opens from 4.30pm until 11.30pm daily, so be sure to drop by Red Gold Steamboat Restaurant @ Batu 11 Cheras when you're craving for delicious, fresh seafood. You didn't have the steamboat? What's the total damage? Hor fun looks good, not good enough for you? I would love the bee hoon too, I'm sure.